I’ve written this review many times. I’m not happy with any of them. Let’s see if this one makes sense. I think I’ve been having a hard time reviewing this book because I really don’t know what I feel. One of the factors I am very confused about is the heroine. Nyx wasn’t likable in my opinion. She’s not your typical selfless heroine that would do anything for her family. No, Nyx is bitter and complains a lot. It gets to the point where she gets a bit annoying. BUT thinking about her as annoying makes me feel guilty. Why? Because I would be complaining and blaming the world for my misfortune. I think anyone in her position would feel this way. Also, what makes me feel a little weird about this book was the weirdly unique love triangle and the first kiss. I felt nothing for Shade. I thought that whatever was happening between him and Nyx was very odd and I had this bad feeling about him from the get go. I didn’t get it. Ignifex was what made the book interesting, and I wish he had a bigger story line. I actually loved the chemistry between Nyx and Ignifex. They made me chuckle and sigh a few times. Why the author made this weird love triangle out of the love story in this book, is beyond me. Nyx and Ignifex were amazing together. The plot was interesting enough to keep me reading. I figured out the main twist pretty early on in the book. The ending caught me by surprise, though. I thought Hodge did a good job with how things get solved. I don't know if this is a series or stand alone. But I kinda want to read what Hodge comes up with next. 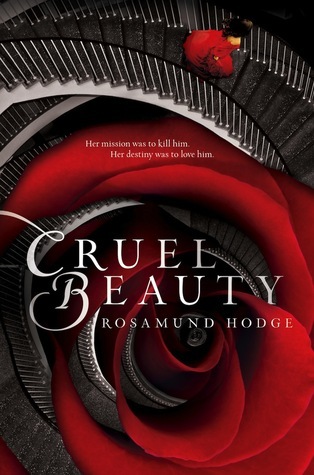 I've been interested in this book since I first read its blurb.I love fairytales and retellings, especially Beauty and the Beast retellings. Beauty by Robin McKinley was one of my favorite books growing up. BUT this book has been getting all-over-the-place reviews. A whiny, but sympathetic heroine, and strangeness concerning the love triangle . . . I've heard several variations of this. And it looks like it is part of a series, so maybe I'll wait and see what comes next. Great review! Maybe you should try the audiobook? The plot itself isn't bad but there were too many weird things happening. Thanks for stopping by. Ah I am sorry you didn't like this one more. I agree that Nyx' character isn't for everyone nor is this retelling. It is very dark and way different than what I expected but I couldn't help loving it. I'm happy you loved it! I wish I loved it too. Maybe I'll like the next book in the series better. Well, those are some interesting character names. It really is too bad when a main character annoys the reader like Nyx did for you. That pulls me out of the story and affects everything for me. I'm happy to see that you were able to give this one a three and that you did get some enjoyment out of Ignifex, but it's too bad that it generally fell a little flat for you. Yes. That's exactly what happened to me. Her being annoying pulled me out of the story and I just couldn't enjoy it. I kept thinking about what other awesome heroines would have done in Nyx's place. I have had this book sitting in my currently-reading shelf on Goodreads but I'm not making any progress. It's really slow. :( I don't feel so guilty now for putting this aside. Thanks, Beth! I've been told to keep at it because it gets better but it certainly doesn't look like it will. I think it wouldn't have made a difference if I finished the book or not. I had made up my mind pretty early on in the book. I knew I liked Ignifex and disliked Shade and Nyx. If you are feeling like is not working then maybe you will end up thinking the same thing I did. I enjoyed this story. I did like Shade but I also really liked Ignifex. This was an odd sort of triangle that I didn't want to be a triangle... I feel like we see so much of what Ignifex brings out in Nyx, I wanted more of what Shade brings out in her character. But I did like the end and the plot overall. I've read quite a few reviews of this one and I still have no clue if I'll enjoy it. I'm not a fan of love triangles, especially unnecessary ones! It's a shame you couldn't really enjoy Nyx that much. I liked her a lot because I thought she was a real character. Not the typical "I'm going to sacrifice everything for the people I love because I am so selfless!". I think the love triangle was really important in the story because (spoiler) Nyx had to learn to love both parts of Ignifex: his dark side and his light side. It's funny because Shade wasn't as important to me. The ending confused me at first, but it still made me swoon. I really loved this book overall.